On Monday morning, Leviim woke up and got in their red, white, & blue ready to celebrate “July 4th.” The chanichim (campers) enjoyed a day filled with waffles with whipped cream, strawberries and blueberries, a baked mac and cheese lunch, a July 4th parade, patriotic singing and dancing, and an American flag made out of cupcakes. That night, the chanichim, along with the rest of camp, enjoyed a special 4th of July talent show and fireworks. On Tuesday, the chanichim had a relaxing day, watching “Big Hero 6” in the afternoon to escape the rain that was falling outside. 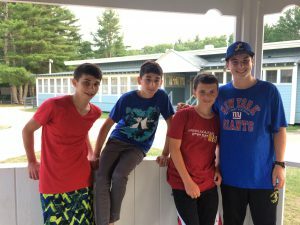 That night, the chanichim enjoyed a scavenger hunt peulat erev (evening activity) planned for them by their Kerem (CITs) which had them running around the machaneh (camp) looking for different clues to complete a puzzle. Afterwards, the chanichim had a brief zimriyah (singing competition) practice where they belted out the tunes to their three songs: shir Yisraeli (an Israeli song), shir Chasidi (a song with Jewish text), and shir aydah (a song written about their unit to the tune of a well-known song). 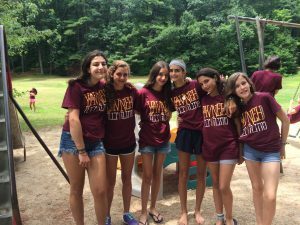 On Wednesday, the chanichim ventured out of camp for their achla yom (trip day) to Silver Lake. They ate lunch under the shade of trees, played games of frisbee and football, and swam in the lake. The chanichim loved it, especially because they got to spend the afternoon hanging out and enjoying each other’s company! That night, the chanichim had an “Anything Bracket” where they competed against each other in a competition of their choice ranging from arm wrestling, to staring contests, to ping pong. The chanichim then returned to their tzrifim (bunks), content with the day and looking forward to the days to follow. We can’t wait to update you again on what lovely Leviim is up to next!